Here are some links to other whip sites which are of interest for whip collectors. Links are listed in alphabetical order. Whip supplier with several items of collector´s interest (S/M related). Well-known whipmaker and supplier in the US. He made for example the whips for Indiana Jones and for Batman/Catwoman. Bernardo del Carpio from Peru makes excellent bullwhips, for example very accurate Indiana Jones replicas. is a whipmaker and western performer from Texas. Whipmaker from Tasmania, makes many styles and colours, also custom orders. Australian supplier of stockwhips and bullwhips (roo, latigo, whitehide), belts and horse gear. Whipmaker Tony Layzell (partially S/M related). Giovanni Celeste from Italy - makes sports and circus whips, plus accessories. Fouets, Attelage et Tradition (Henri Baup, whipmaker from France). Well-known whipmaker from the USA, makes snakes, signal whips, bulllwhips and specialty whips of hides varying from kangaroo over buffalo to exotic like shark or sting ray (S/M related). Karaka Whips offers a synthetic Stockwhip (patent pending), designed for all weather conditions. Olaf Fischer makes beautiful fancywork, including a cat o´ nine tails. Nylon hybrid whips, "Snignal" whips. Maker of nice Nylon bullwhips, signalwhips and others. He made my 6ft target bullwhip, my beautiful matched pair stockwhips and my twotone blacksnake. Top quality whips at reasonable prices. A must for collectors. Rhett makes top quality bullwhips, signal whips, stockwhips and Florida cowwhips from Nylon. Si Davey sells a vast range of bullwhips, snake whips and stockwhips all handcrafted from kangaroo hide. Whipmaker Ian Snow (S/M related). Quality whips by Victor Tella (partially S/M related). A maker of high-quality Nylon cowwhips, blacksnakes and bullwhips. A specialty are his "dinowhips" of 20ft and more. Sells bullwhips, crops and others. 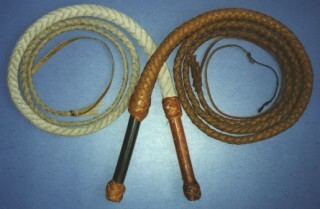 Replications of old or broken whips. S/M related. New whip supplier in Germany, offering, bullwhips, signal whips and more (partially S/M related). Many items in stock! Makes bull and stockwhips with natural wooden handles. Australian and American whips, bullwhips and specialty whips. Troels Jespersen makes multitail whips for consensual use in unique designs (S/M related). The highly recommended standard link on almost every whip page. Full of informations on whip use, care, buying, types etc. Partially S/M related. Sports whipcracking page with a highly interesting, long article about the phsics of the whip crack. This is the first sports whipcracking page in German language. Die erste Peitschensport-Seite in deutscher Sprache.